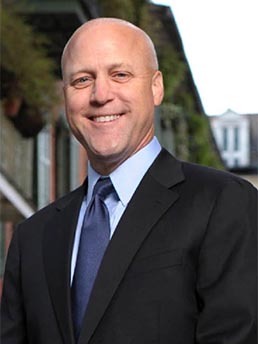 The LBJ School of Public Affairs and the Annette Strauss Institute for Civic Life at the University of Texas at Austin will welcome former New Orleans Mayor Mitch Landrieu to the UT campus on Tuesday, Sept. 18. Angela Evans, dean of the LBJ School, will lead a conversation with Landrieu at the Texas Union Theatre from 12:15 to 1:45 p.m.
Landrieu became the 61st mayor of New Orleans from 2010 to 2018, taking office when the city was still recovering from Hurricane Katrina and was in the midst of the BP oil spill. Under his leadership, New Orleans is widely recognized as one of the nation’s great comeback stories. Landrieu’s decision to remove four Confederate monuments in New Orleans and his speech explaining it vaulted him into the national spotlight in 2017. He examines racism and the lingering shadow of the Confederacy in America in his New York Times best-selling book, “In the Shadow of Statues: A White Southerner Confronts History” (2018).